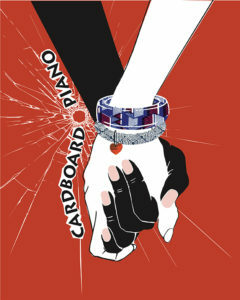 The second show in International City Theatre’s 33rd Season is the West Coast Premiere of Cardboard Piano; a powerful play about intolerance, war, forgiveness, and love. Artistic Director caryn desai first saw Cardboard Piano premiere at the Humana Festival in 2016 and couldn’t be more thrilled to be directing the West Coast premiere of this important, powerful play. The story begins on the eve of the millennium in a Northern Ugandan village. It is 1999 and the Ugandan Civil war has been terrorizing the Ugandan people for about 14 years with no end in sight. While the story of Cardboard Piano is fictional, the realities of the Ugandan Civil war are anything but. Since the war’s initial outbreak in 1986, hundreds of thousands of civilians have died and over 1.4 million people were displaced from their homes. The initial rebellions that eventually lead to this civil war began with revolts against the new Museveni regime by ousted army troops and the Acholi population. Though these movements were eventually overshadowed, they did pave the way for the much more familiar Joseph Kony and his creation of the Lord’s Resistance Army, or LRA. The LRA also sought to resist the new Museveni regime, but took much more drastic measures to do so. When President Museveni began using Uganda’s military to battle the LRA and like rebel groups, the rebel groups looked to children to serve as their soldiers. In an attempt to alleviate the amount of children abductions, the Ugandan government began encouraging families to retreat to protective camps. Of course, the government had no way of knowing that millions of civilians would drop everything they had to come to these camps. Because of this, no one stuck around to tend to the agriculture, Uganda’s economic base, so hunger was widespread and the economy was destroyed. The story of Cardboard Piano breathes new life into Ugandan history, and explores the human capacity for hatred, forgiveness, and love during war. Cardboard Piano will perform at the Beverly O’Neill Theatre at Long Beach Performing Arts Center from May 2 – May 20, 2018. There will be a post-show talk back on May 13th following the 2 PM performance. To buy tickets or inquire about season subscriptions, please call the box office at 562-436-4610 or click Buy Tickets.